You decided to go surfs up for the evening and grill up your favorite fish filet. After marinating or seasoning your fresh catch choice, you hit it to the grill. Then at the moment of truth when removing the fish from the grates, you find yourself with a mangled piece of what was once a beautiful filet. This isn’t what you intended to present to your family and friends. Don’t worry we have all been there, but have no fear there is a solution to the problem! There are many different reasons as to why fish can be difficult to grill; not preheating your grill long enough, cooking at the incorrect temperature, dirty grates, and not applying olive oil are some of the main ones. The biggest thing to be aware of is that majority of fish is delicate, which is why it can be challenging to grill directly on the grates. Today I’m going to talk about one of Weber’s accessories, which will take the hassle out of grilling fish. The accessory I speak of is Weber’s Original Stainless Steel Fish Basket. No matter what filet of fish your cooking, the basket will prevent it from sticking to the grate and set you up for a great presentation come dinnertime. Apply a coat of olive oil to both sides of salmon filet and season with desired ingredients. Today I kept it simple with salt, pepper, and granulated garlic. Open the fish basket so it is facing towards you and place filets along the basket, leaving a little space in between each one. Close basket down and make sure the basket is clipped completely because you will be flipping it halfway through the cook time. Place basket over direct medium-high heat for 8 minutes total, flipping the basket once. Tip: Adding some wood chips to the grill will create additional smoke, which imparts great flavor on your salmon. Today I added 3 handfuls of soaked grape wood chips on top of my hot coals. Using Weber Mitts, remove fish basket from grill and place on a hot safe surface. With the mitts still on open the basket and use a fork to gently lift salmon off the bottom part of the basket. 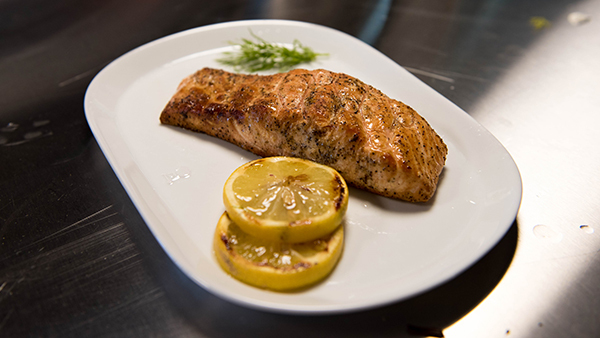 Serve salmon with a couple grilled lemon wedges and a garnish of dill. 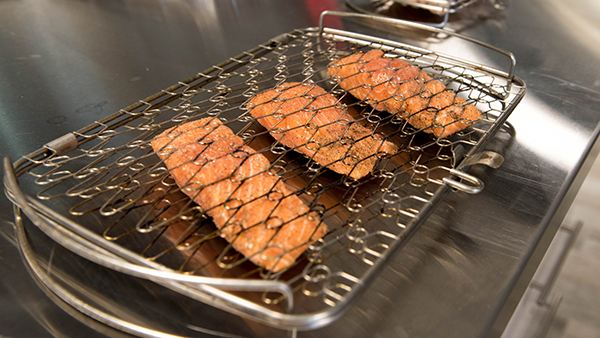 Thanks to the Weber Fish Basket you will have an awesome presentable plate of salmon! Grill on!